TK4NT electronics let you be heard in plugged-in situations. The Takamine EG540C-STCY Acoustic Electric Guitar features a Flamed Maple top Back and Sides, rosewood Fingerboard, dot Inlays, concentric rings Rosette and chrome tuners. The NEX Cutaway shape allows access to upper frets. Figured maple top, back, and sides. Rosewood fingerboard and chrome tuners. TK4NT electronics let you be heard in plugged-in situations. Takamine guitars always have exceptional visual style and rich sound, and this one is no exception. exceptional value in a quality acoustic/electric instrument. The Takamine EG540C-STBY Acoustic Electric Guitar represents an exceptional value in a quality acoustic/electric instrument. The Takamine EG540C-STBY Guitar features cutaway NEX body shape, rosewood bridge, sealed chrome tuners, bound neck and body and concentric rings for the rosette. The built-in TK4NT Preamp gives you a tunable notch filter, switchable midrange contour and a handy on-board tuner. Flamed maple is used for the top, back and sides while a transparent, gloss finish lets the beauty of the wood show through. A hard maple neck supports a 21-fret rosewood fingerboard with dot inlays. The Takamine EG540C-STRY Acoustic Electric Guitar features a Flamed Maple top Back and Sides, rosewood Fingerboard, dot Inlays, concentric rings Rosette and chrome tuners. The NEX Cutaway shape allows access to upper frets. Rosette design is finely worked abalone. Figured maple top, back, and sides. Rosewood fingerboard and chrome tuners. TK4NT electronics let you be heard in plugged-in situations. Takamine G series – A superb value range that has proved popular with many gigging musicians and up and coming star-lets. The Takamine EG124SC Acoustic Electric Guitar Classic Gloss acoustic with nato back and sides, Solid Spruce top and Gold Machines. The warm-sounding N4B preamp is featured on selected G Series models. The G Series from Takamine has created great controversy. Play a G Series guitar and you’re apt to think it’s one of the finest acoustic-electrics made. Guitars that will grow with you. TK4NT electronics give you superb sound when plugged in. The Takamine EG531SSC Acoustic Electric Guitar features a solid Spruce top, Sepele back and sides, a rosewood fingerboard, TK4NT preamp, chrome tuners. Cutaway body gives you easy access to the upper frets. Dot inlays, chrome tuners, and abalone rosette are the perfect finishing touches. The TK4NT electronics give you superb sound when plugged in. The G Series from Takamine has created great controversy. Play a G Series guitar and you’re apt to think it’s one of the finest acoustic/ electrics made. Guitars that will grow with you. A spruce top gives the Takamine EG561C Acoustic Electric Guitar exceptional tone and responsiveness. Small, slim, FX body style makes this an unusually comfortable guitar and the exclusive gloss black finish makes it especially impressive looking. Comes ready to plug in with a TK4N preamp that gives you a tunable notch filter and switchable midrange contour. full round tone and maintains this great sound when it’s plugged in too. The Takamine EG330SC-OBB Acoustic Electric Guitar offers exceptional quality and value backed by Takamine’s limited lifetime warranty. This solid topped acoustic-electric dreadnought cutaway produces a full round tone and maintains this great sound when it’s plugged in too. Constructed with a solid Spruce top, Mahogany back and sides, and a Rosewood fretboard, the Takamine EG330SC-OBB Acoustic Electric Guitar is quality through and through. The preamp is the very same style and performance system that were found on the pro series guitars. This guitar sings with superb clarity and colorful contrast. Takamine EG330SC-OBB is designed to be special instrument. The G Series from Takamine has created great controversy. Play a G Series guitar and you’re apt to think it’s one of the finest acoustic-electrics made. The Takamine EG330SC Acoustic Electric Guitar offers exceptional quality and value backed by Takamine’s limited lifetime warranty. This solid topped acoustic/electric dreadnought produces a full round tone and maintains this great sound when it’s plugged in too. Constructed with a solid Spruce top, Mahogany back and sides, and a Rosewood fretboard, the Takamine EG330SC Acoustic Electric Guitar is quality through and through. The Takamine EG240RS Acoustic Electric Guitar is Spruce top acoustic guitar with pickup. Dreadnought/Gloss acoustic with nato back and sides, spruce top and bound fingerboard. 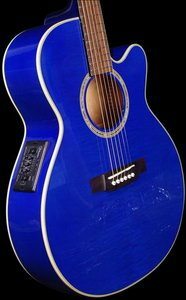 If there is one guitar that usually winds up being your first guitar, or the guitar in your collection you play most often, it’s the Takamine EG240RS. a consistent favorite of coffeehouse and arena guitarists for its strong and clear midrange. The Takamine EF261SBL Acoustic Electric Guitar features FXC/Artist body shape, concentric rings rosette, solid cedar top, dot inlays, mahogany back and sides, rosewood fingerboard, Graph-EX electronics and chrome tuners. The Takamine EF261SBL Acoustic Electric Guitar are a consistent favorite of coffeehouse and arena guitarists for its strong and clear midrange. a beautifully warm, balanced tone. The Takamine EF261SAN Acoustic Electric Guitar stunning Glass Antique Stain, solid cedar top and mahogany body produces a beautifully warm, balanced tone. Very stylish looks come from the unique FXC body shape, mahogany back and sides, rosewood fretboard, and chrome tuners. Unbelievable tone emanates from the solid cedar top and custom Graph-EX electronics with graphic EQ. The Takamine EF261SAN Acoustic Electric Guitar are a consistent favorite of coffeehouse and arena guitarists for its strong and clear midrange. was conceived to give you the biggest and widest acoustic sound possible. 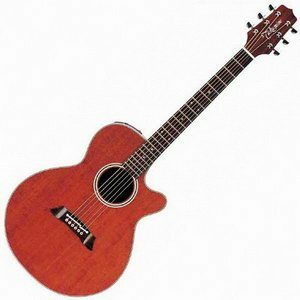 The Takamine EAN70 Acoustic Electric Guitar features a solid cedar top, mahogany back and sides, 20 fret rosewood fingerboard, CT4B electronics. The Takamine Natural Series was conceived to give you the biggest and widest acoustic sound possible. Naturals are so alive with sound that they nearly jump out of your hands. The clean and simple approach of the Naturals has been imitated by other makers, but nothing yet has compared to the purity of style and sound of the original.